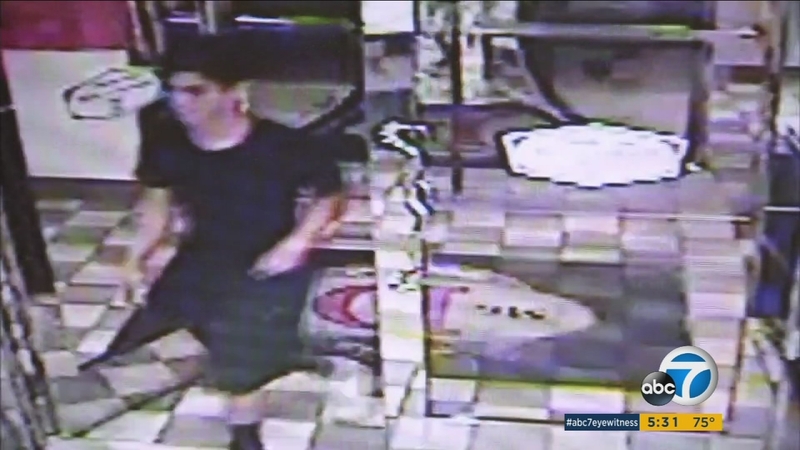 An arsonist was caught on camera using his pants to set a fire behind a diner in La Verne, according to police. LA VERNE, CA -- An arsonist who was caught on camera using his pants to set a fire behind a diner has been arrested, according to police. La Verne police said Alan Cheng, a 19-year-old transient from Pomona, was arrested after he set several fires and caused damage to multiple businesses at about 9 p.m. on Tuesday. Cheng was seen acting erratically and holding a knife inside the restaurant before he set fire to a grease container outside, according to restaurant staff and police. Officials said before heading to the diner, Cheng smashed out windows at three other businesses and set fire to several trash cans, a car and a gazebo. He then entered Mr. D's Diner, ordered food and then went into the bathroom, where he was apparently breaking things, according to diner owner Stefano Kosmides. "He broke a lot of stuff in the restroom and then they saw he had a knife. They started getting worried about their life because he was obviously on drugs," Kosmides said. After he ran out of the restaurant, he took off his pants and lit them, to set fire to a grease container behind the restaurant, police said. Authorities said Cheng fled and a restaurant worker spotted the blaze and helped put it out before the restaurant caught on fire. The restaurant's staff said it found drug paraphernalia outside by the grease container and the man's knife left behind in the booth. Cheng was arrested on Sunday and booked on multiple counts of arson and vandalism, according to police.